R programming language tutorials are listed below which are ideal for beginners to advanced users. R language is the world's most widely used programming language for statistical analysis, predictive modeling and data science. It's popularity is claimed in many recent surveys and studies. R programming language is getting powerful day by day as number of supported packages grows. Some of big IT companies such as Microsoft and IBM have also started developing packages on R and offering enterprise version of R.
The following R language tutorial are designed for novice users who have no programming background or new to R programming language. 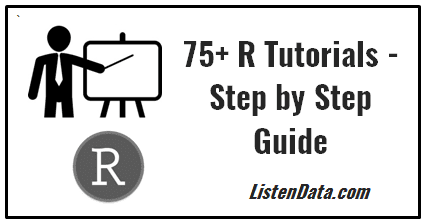 These tutorials help them to get started with R. Once you understand basics and fundamentals of R such as importing and exporting data, data exploration and manipulation, you can switch to advanced R tutorials such as how to apply loop and creating functions in R.
These tutorials aimed at people who want to build a career in predictive modeling and data science. It covers various data mining, machine learning and statistical techniques with R. It explains how to perform descriptive and inferential statistics, linear and logistic regression, time series, variable selection and dimensionality reduction, classification, market basket analysis, random forest, ensemble technique, clustering and more. These tutorials would help you to understand the basics of text mining with R. It includes tutorials on extracting and analysing data from Facebook and Twitter. It also explains how to create word cloud by demographics and perform sentiment analysis with R.
This tutorial helps you to prepare for interview for R programmers and data scientists roles. It includes more than 75 interview questions with detailed answers. After completing this tutorial, you would have fair chance to crack technical R interview.